After months of planning for your perfect dream wedding, the big day has finally arrived. This is the time when you can finally relax and enjoy all the hard work and planning your have put into your special day. However, it can be difficult to sit back and truly enjoy your wedding. Many couples think that once the wedding starts, they will be able to sit back and enjoy the celebrations of their love, but that is easier said than done. You may notice every little detail that doesn’t turn out as planned and worry about how people are enjoying the reception. You may stress about the schedule delay or that the weather is not what you expected. Worrying about these minute details is pointless. The wedding is already planned and whatever happens is going to happen. As a couple, you need to figure out how to enjoy your special day. We understand how hard it can be to be present, relaxed, and enjoy your wedding, but it is important. This is one day in your life that you should remember forever and that you should enjoy until the very end. In this blog, we will give you tips to enjoying and being present at your wedding; these may be the most important wedding tips you ever read! Not everything is going to go perfectly at your wedding. Something will happen that you cannot control and you need to learn to accept that. 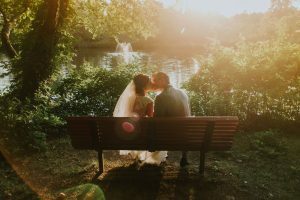 The sooner you realize that your wedding is not going to be perfect, no matter how much you plan, the sooner you will be able to enjoy your wedding. While it may be difficult, remind yourself throughout the wedding to go with the flow, don’t stress about things outside of your control, and don’t worry about the small details. Most of your guests won’t even notice that something went wrong, so you shouldn’t pay attention to it either! 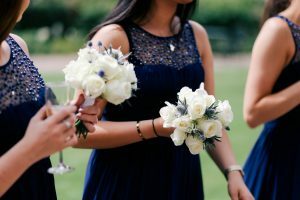 Whether you make your maid of honor, the bridesmaids, or your mom help you out, putting someone else in charge can help you worry less about making sure everything runs smoothly and focus on enjoying the day. Delegate some help to round-up the wedding party for photos, help guests find their seats, and make sure everything sticks to your schedule. This will allow you to spend more time actually enjoying your wedding, talking to guests, and spending quality time with your new spouse. It may be hard to give someone else control, but it is important to do if you want to relax during your wedding. While you have planned your fancy and beautiful wedding for months, there is one purpose for this celebration, and it is important to remember what it is. With all the stress of planning, the excitement of the big day, and the worrying to make sure everything goes as planned, it can be easy to forget why you are there in the first place. Throughout the wedding, remind yourself to focus on the special moments between you and your loved one. These are the moments you want to remember forever. Allow yourself to focus all your attention on these moments as they happen. When you or your partner are walking down the aisle, be all there. Focus on the way you feel, the way they look, the happiness that is filling your heart. This is not the time to worry about the weather or the music choice. You want to be 100 percent present and focused on these important moments during your wedding so that you can remember them forever. Pay attention to the vows you read to each other, your secret conversation during your first dance, and any other special moment the two of you share. This is the purpose of your wedding, not the guests or the centerpieces you spent hours choosing. Social media may have taken over every other aspect of your life, but do not let it take over your wedding. Stay off your phone and don’t feel the need to share this moment with anyone who is not there. In other words, stay present. You will want to make sure you are focused on your wedding and be present during the entire day. This will help you enjoy the day more and allow you to remember the smaller details. If you are on your phone, texting your friend who couldn’t make it, updating your Snapchat story, or posting on other social media accounts, you will not truly be paying attention to your wedding or enjoying it. This is your special day; don’t share it with everyone else. Relaxing before your wedding day is important to relaxing on your wedding day. Try to not leave any tasks to the week before your wedding. Make sure you have everything planned and done at least a few days before your wedding. You don’t want to be stressing during the days leading up to your wedding, so be sure you get everything figured out before hand. Spend the days leading up to your wedding relaxing and spending quality time with your soon-to-be spouse. During your wedding, be sure to spend some quality time with your love. Take a moment to sneak away and just enjoy each other’s company. It is easy to give your guests all of the attention during your wedding, so be sure to take a step back and take a moment alone with your partner. This will help you remember the purpose of the day and reconnect with your new spouse. People always joke about how you are so busy talking to your guests during your wedding that you are likely going to forget to eat. Don’t forget to eat and stay hydrated. “Hanger” is a real thing, and the longer you go without food, the more likely you will start getting more frustrated with little things and feel emotional. Make sure you take time to eat and drink. You spent a lot of time picking out the perfect menu, so enjoy it. These are a few of the main tips you need to follow during your wedding to enjoy the celebration more. No wedding is perfect; accepting that is the first step. Be sure to take a moment alone with your spouse during the wedding. This is your day and you both need to reconnect and remember why you are having this wedding in the first place. If you are still planning your wedding, be sure check our Bohemia River Overlook. With three different locations at our venue, you can plan the wedding that matches your style and vision. Our outdoor wedding venues can help you complete your wedding plans! Contact us today to learn more and start planning your wedding today.